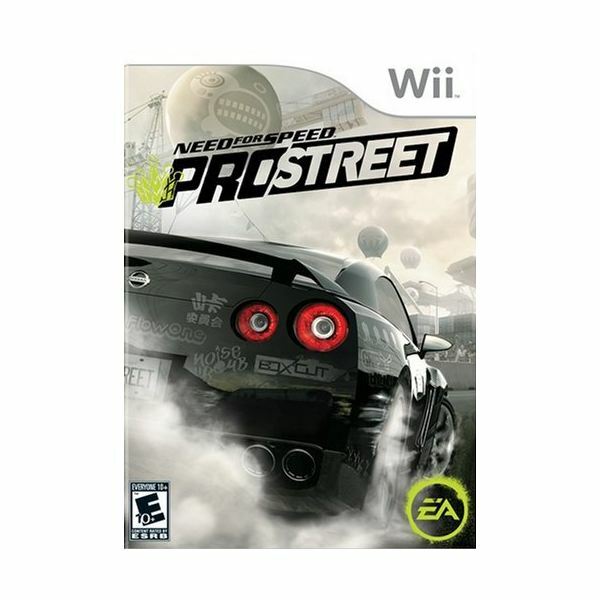 Developed by Black Box and published by Electronic Arts, Need for Speed: Prostreet is the eleventh game in the long-running racing series and the second to hit the Nintendo Wii. As the name suggests, this 2007 release focuses on the world of street racing, and focuses on a fictional driver named Ryan Cooper who is working his way up a professional street circuit in an attempt to dethrone top racers, known as the Elite Kings. The game features several different modes of racing, and while it does provide decent action, there’s nothing here that really stands out as anything special. There are worse racing games out there, but then again, there are better ones as well. The big hook here is the Career mode, during which players assume the role of Cooper and, in between the cut scenes that tell the rather thin and pointless story, you will tour real-live locales in an effort to successfully complete a number of different challenges. In some you will be given pre-tuned vehicles and will work to earn other rides, while in others you will have a chance to pimp your own rides and cruise your way to the winner’s circle. Among the types of races you’ll be participating in are standard-style three-lap affairs (called Grip Races here) as well as fastest lap challenges and drag races. Each set of challenges has a target number of points you are supposed to earn by winning and performing well throughout the different events, thus "dominating the weekend" and advancing to bigger and better racing challenges. Be careful, though, because you car takes damage if you drive aggressively and bump too much. It does feel a little slow at times, and while some have complained about handling issues, I really can’t say the cars felt all that unrealistic. On the whole, there’s a fair amount of depth here, but the Wii version of Need for Speed: Prostreet is unfortunately missing some key components of the Xbox 360 and PS3 versions — most notably, online multiplayer, which is nowhere to be found on Nintendo’s console. As mentioned above, there are two main types of races here, standard style Grip Racing and straight-line Drag Racing. Each sports its own unique control scheme as well. The Grip Racing is done by holding the Wii remote sideways and twisting it to steer, hitting the 2 button to accelerate, the 1 button to brake and reverse, the + button to pause, B to activate nitrous and A to activate the handbrake. While the control scheme advises you to hold the Wiimote flat, in such a way that the B button is facing the floor, don’t panic. The Wii Wheel works quite well with the Grip Racing mode. Drag Racing is another story, as it requires you to hold the remote vertically like a joystick, tilt forward and backwards to shift, left and right to steer, B to accelerate and A for the turbo boost. While there’s nothing wrong with the developers trying something different, the Drag Racing controls are rather imprecise, and it’s annoying having to continually pop the Wiimote in and out of the wheel casing for different types of racing. Visually speaking, the game is quite average. The cars look okay and the courses are impressive enough, though the infrequently seen character models could use work. The game allows you to race in either first or third-person modes, but the game definitely looks better and feels more natural when using the bird’s-eye view. There’s nothing here that will wow you, but the graphics are solid enough to not be a distraction either. The sound effects are nice, and there’s something satisfying about hearing the roar of the engine as you rev it and the squealing of the brakes around a sharp turn. On the other hand, the voice acting is rather mediocre and, as a matter of personal taste, I found the licensed soundtrack to be loud and irritating. While I enjoyed the time I spent playing Need for Speed: Prostreet, at no point was I blown away by it. For me, the highlight of the game was the standard racing style of play, and while the drag racing controls are innovative, I found that they really didn’t work all that well and they created unnecessary hassle for those of us who prefer to utilize the Wii Wheel. The game looks good enough, it sounds good enough, and it plays good enough, though the lack of Wi-Fi support is certainly problematic. If I really wanted to play a racing game and this one was readily available, it would certainly fit the bill, though I wouldn’t go out of my way to track it down or anything. I guess I’d have to say that I found it to be remarkably average. If you’re a big-time driving game fan, Prostreet is most likely a good purchase, as long as you can find it for between $15 and $20.